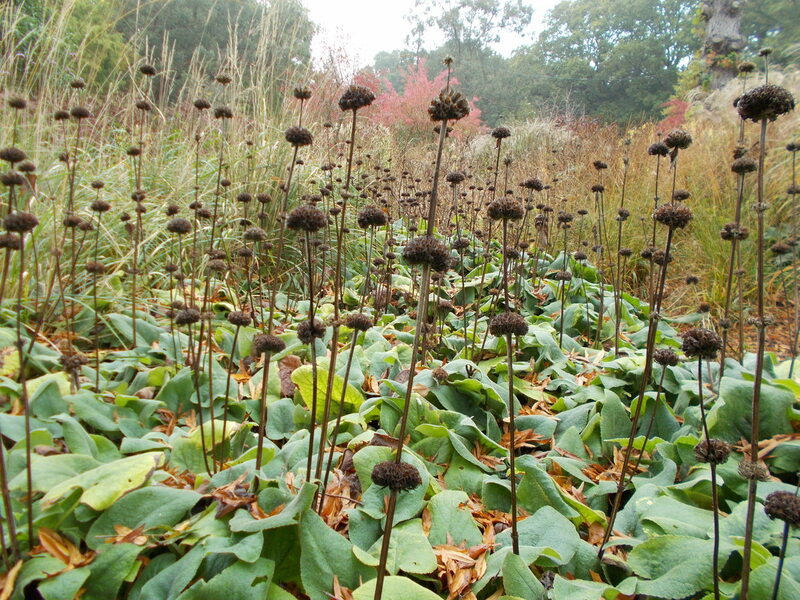 The Green Fingered Blog: Cutting back perennials - what do you do with the bits you cut off? 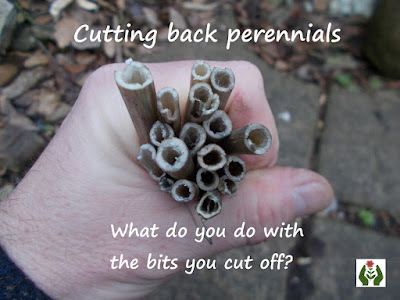 Cutting back perennials - what do you do with the bits you cut off? As winter turns to spring, perennial plants start to produce new growth, which means it's time to cut down what's left of last year's dead stems and seed heads. But what do you do with them all? I'm not a believer in "putting the garden to bed for winter". It's quite possible, in the UK at least, for a garden to keep looking (fairly) good (though not necessarily staggeringly impressive) all year round. 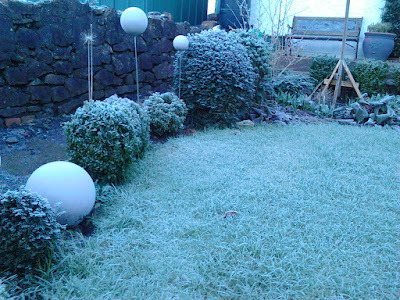 Evergreen planting can provide structure, and can look good in winter frost and snow, meaning the view from the window doesn't have to be too drab. There are even a few shrubs which offer scented flowers at a time of year when you might not expect them, offering much needed encouragement to get outside and brave the elements to earn a fragrant reward. Even the dead stems and seed heads of last years borders can add vital interest through the winter months, so I leave as many standing as I can. This is beneficial for garden wildlife as they can provide food for birds and hibernation places for insects. 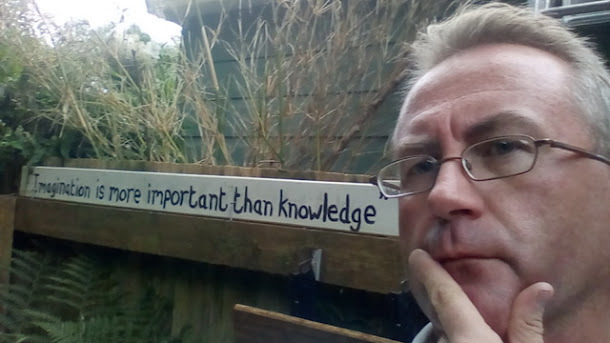 Of course some insects are pests, but by encouraging as many things as possible to take up residence in your garden, there is a better chance of things balancing out. 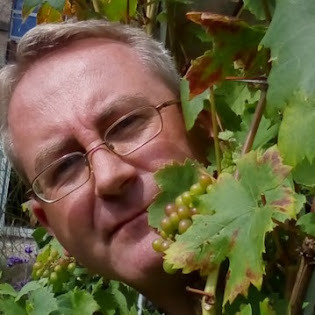 My aim is to enable a healthy garden with a diverse range of habitats so that pests are controlled by their natural predators. And who doesn't enjoy watching the birds in their garden? 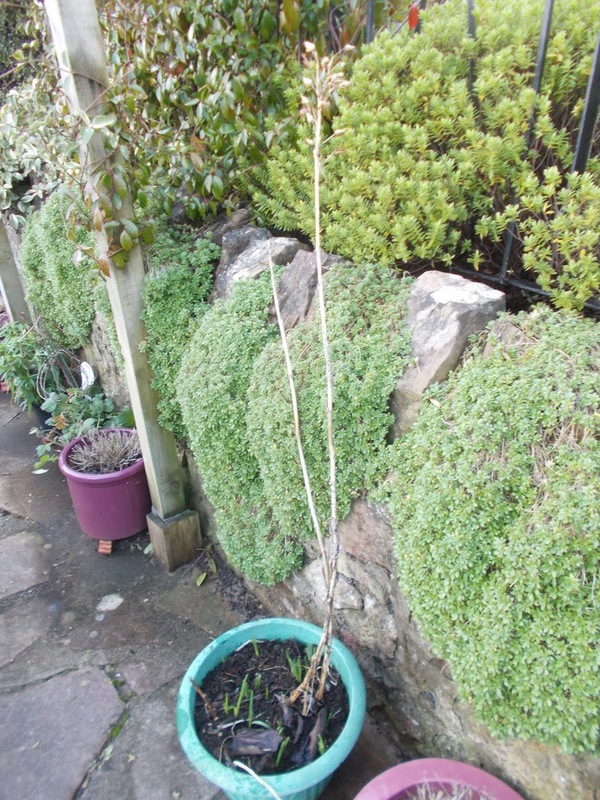 So I tend not to cut things back until it is necessary to make room for the new years growth as spring takes hold. 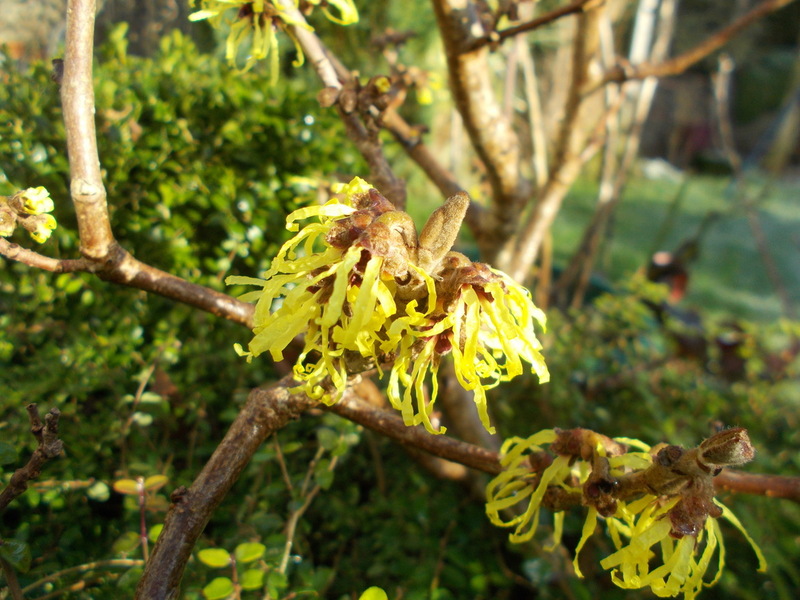 However, sooner or later the winter storms, continual cold and or wet, or the natural process of decay will take its toll and leave many plants looking decidedly unattractive. I cut them down when they collapse. And as the shoots of spring bulbs appear above ground, and plants begin to produce buds of new leaves, stems and branches, I start cutting back what's left of last year's perennials. Annuals can also be left and will need cutting down too. This pot of nicotiana was stood in a border and looked quite statuesque long after the flowers had died and gone to seed. However, the plants surrounding it have now died back, exposing the pot which had been hidden. 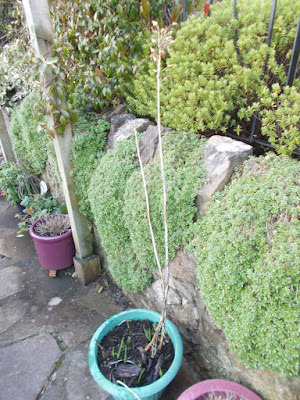 The bulbs also in the pot are now growing, and the nicotiana stems are no longer architectural, they are just untidy. So time to cut them down. In fact in many cases, cutting back in spring actually stimulates or encourages new growth, and helps make it stronger and more vigorous. But what can you do with all the dead stems you cut down? You can add them to your compost heap if you've got one. But you need to cut or shred them into as small pieces as possible or they are unlikely to fully decompose in a domestic heap. With all the woodier items which are harder to compost, I prefer to use them to help wildlife thrive in my garden. 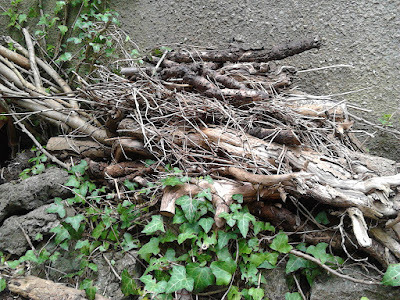 I bundle twigs and woody stems that are difficult to compost into piles and put them underneath trees and shrubs. They can be used as nesting material by birds, a breeding site for insects, or as a winter hibernation place for all sorts of critters, and even toads or hedgehogs. Toads and hedgehogs can eat plenty of slugs so it's worth encouraging them to hang around in your garden. Hollow stems can be pushed into crevices in stone walls, or bundled up and hung in a tree. 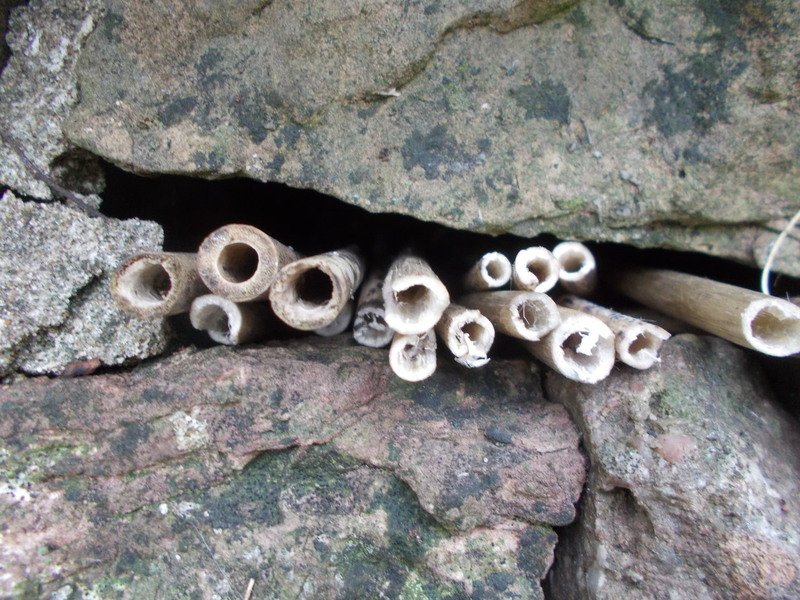 They are potential nest sites for bees and other insects like lace wings and ladybirds. Both ladybirds and lacewings will eat greenfly and other pests. Pests will always find a reason to live in your garden and cause problems. 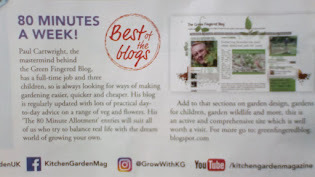 It's up to the gardener to give the lace wings and ladybirds a reason to be here too, so that they can keep the pests under control, reducing the need for any chemicals. We all know that bees are important pollinators. If you want your plants to produce fruits or seeds, you need pollinators! 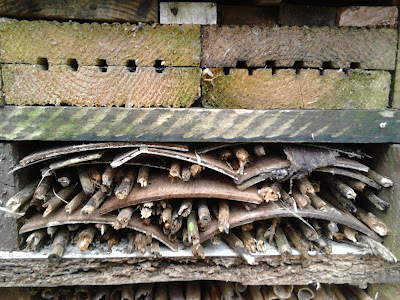 Of course if you have a bug hotel, many of the dead material you cut back can be put into it as nesting or hibernation sites for a wide range of insects. 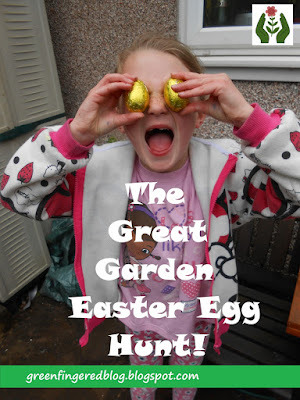 Make the most of your garden - even the dead bits!